Origins. All that is known of Saint Benedict (AD 480-547) is contained in the Second Book of Dialogues (see link below) written by Pope Saint Gregory I (540-609). This biographical account tells of a young man who fled the temptations of a student's life in fifth century Rome and took refuge in a life of solitude and prayer in a remote cave. Benedict's anchoritic life was briefly interrupted by a harrowing stint as Superior of an unruly group of monks, and then entirely brought to an end when men seeking to follow Benedict's guidance were gathered by him into twelve monasteries which he established. The concept of a "religious order" did not exist in the time of Benedict, and he would not have seen himself as founding an order of monks. He wrote his Rule for Monasteries (see link below) which was apparently intended to guide the monks of the monasteries established by Benedict, but it is likely that it would have been replaced by a new rule written by the abbots who succeeded him. It must be noted here that although Benedictines refer to their Patriarch as "Holy Father Benedict" he was not a priest. In fact, Benedict's Rule directs that priests are to be admitted with some hesitation, and that only a few monks are to be ordained. Since the priesthood is by its very nature a ministerial role in the Church, it has often been seen as in conflict with the ideals of contemplative western monasticism. But since the celebration of the Holy Eucharist is at the center of a liturgical life, the services of a priest are required, and it has been the best practice for a community of monks to include ordained members. Spread of the Rule. Christian Monasticism found a wide variety of expressions wherever Christianity took hold. Both men and women retreated from the world to live in solitude or in communities and monastic observance varied greatly from one monastic establishment to the next. The Rule of Benedict did hold a place of prominence among monastic literature, representing wise, sober, and balanced doctrines and observances for its time. It was widely promoted throughout Europe by Saint Benedict of Aniane (747-821) as part Emperor Charlemagne's campaign toward total uniformity throughout the Holy Roman Empire. The monastic reform component of this campaign was not always met with open arms, as most monasteries valued their autonomy and own unique customs. Establishment of an Order. The founding of the Abbey of Cluny in 910 has been hailed as the actual moment in monastic history in which the "Order of Saint Benedict" was established. 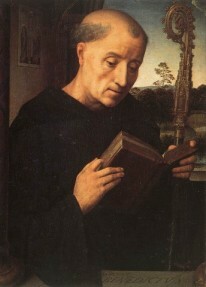 It has been argued that although the Rule of Saint Benedict was at last embraced as the official spiritual guide for Cluny, many of the ideals of the Rule were mitigated or neglected. Cluny established a number dependent monasteries that remained permanently under the jurisdiction of the motherhouse and one Abbot. As Cluniac monasticism rose and declined, other congregations of Benedictine monasteries formed on the Cluniac model, while other Abbeys founded daughter houses that were granted autonomy and elected their own Abbots. The establishment of monastic universities and the clericalization of monasteries greatly changed the face of Western monasticism. Clericalism led to the creation of two distinct classes of brethren within monasteries: (1) Choir Monks who were deemed "fit" for a formal education and thus for ordination. These monks professed "solemn vows," enjoyed full voting (chapter) rights, and were qualified to hold positions of authority in the community; and (2) Lay Brothers who were judged to have "more brawn than brains" who professed "simple vows" and lived a life of labor and service to the monastic household, and often lived in quarters that were separated from the Choir Monks. Benedictine abbeys became great centers of learning and culture where they housed magnificent libraries and collected exquisite works art. Some monasteries imitated royal and ecclesial palaces, opening their doors to a number of worldly concerns that would not have been allowed across the cloister threshold by the Rule in earlier days. Attempts at Reform. A number of reform movements arose throughout Benedictine history. The most notable one was the rise of the Cistercian Order, which resulted from the reforms introduced at the Abbey of Citeaux in Francis 1098. Originally founded by Saint Robert of Molesme (1029-1111), its spirituality was highly influenced by Saint Bernard of Clairvaux (1090-1153). This same group underwent even stricter reform at the Cistercian Abbey of La Trappe in 1664. This group became known as the Cistercians of the Strict Observance (commonly referred to as "Trappists"). (It has been falsely believed that this order takes a "vow of silence." Although silence was strictly observed to the point where a unique form of sign language was developed in Trappist houses, no such vow has ever been pronounced by monks or nuns of this or any order in the Catholic Church). Primitive Observance and Autonomy. Benedictine Abbeys of monks and nuns established daughter houses that carried with them customs and ideals from the motherhouse to places all over the world. These "families" of monastic foundations became identified as "congregations" of (with a few exceptions) autonomous houses. Although identified as "Benedictine," expressions of the tradition varied from strictly cloistered houses, to those devoted to education and pastoral work as well. Dom Pietro Francesco Casaretto (1810-1878) founded the Cassinese Congregation of the Primitive Observance which revived the more "contemplative" aspects of Benedictine observance. This Congregation is known today as the Subiaco Cassinese Congregation and its world-wide membership includes 64 monasteries of men and another 45 affiliate houses of women. On July 12, 1893, Pope Leo XIII established the Benedictine Confederation in Rome. Although member monasteries and congregations continue to maintain their autonomy, membership in the Confederation--either as a congregation or as an independent house--is required for those monasteries belonging to the Order of Saint Benedict. Renewal. The Second Vatican Council convened from 1962 through 1965. In looking toward the future of the Catholic Church, the Council Fathers directed the Church to look back into the past--back to the very origins of Christianity. Returning to our roots extended to the renewal the Consecrated Life, which included monastic orders of men and women. Council reforms abolished the distinction between choir monks and lay brothers, welcoming all monks to pronounce the same solemn vows and to share in the same way of life. Ordination was no longer a requirement, and many monks, even those who would pursue advanced degrees, did not seek ordination. The Council's spirit of renewal inspired and supported the growth of contemplative Benedictine congregations, such as the Subiaco Cassinese Congregation. Liturgical reforms of the Second Vatican Council encouraged the use of Latin Gregorian Chant in monasteries and renewed emphasis on the celebration of all the canonical hours of the Divine Office at proper times throughout the day. The Vows. The monastic vows, according to the Rule are: Obedience, Stability, and an ancient vow called Conversatio morum. Obedience is probably a harder concept to accept in the modern world than celibacy or poverty. The first word of the Rule 'obsculta' (an old Latin word meaning 'listen') and 'obedience' are quite similar in their roots. In the professional world, most people are expected to cooperate with a boss, a colleague, or a client. This cooperation is also expected in the monastery. The difference is that the monk practices this cooperation in imitation of Christ who by his obedience to the will of the Father turned the tide that the disobedience of our "first parents" set in motion. Stability means that the monk decides to dedicate his life to God in one community for life. This place and these monks become his home and his family where he will 'work out his salvation' and sanctification. Conversatio Morum are ancient Latin words that have often been misunderstood or even misinterpreted. This vow is defined as the promise to live the monastic life, which include the practice of celibacy (renouncing the marital commitment to one person and the conjugal relations associated with it) and poverty (the renunciation of personal possession of property). The Abbot. According to the Rule, the monastic community is a family of men living under the guidance of a father known as the Abbot. The word 'abbot' finds its origins in the Aramaic word 'abba' which Jesus used to address his own Father in heaven. In the early centuries of Christianity, certain renowned hermits were addressed as 'Abba' and revered as special teachers of the spiritual life. When monasticism went from being eremitical to cenobitical, 'abba' evolved into the word 'abbot.' In the Rule, the Abbot is the father of the community who also holds the place of Christ as teacher and master amongst the brethren. According to church regulations, a monastery may elect its first Abbot when certain criteria have been met. In its early days, a Prior is elected or appointed as superior of the house and holds that 'Abba/Christ' role in the monastery. Community. Life shared in common sets cenobitical (community) monks apart from eremitical (hermit) monks. Community life is the monk's greatest blessing and his biggest cross. He finds himself as one sinner living among many, relying on the grace of God to make all of his day-to-day experiences with his brothers a means of spiritual growth and sanctification. The Liturgy. The daily life of a monk is punctuated by the liturgy: the daily celebration of the Holy Eucharist and the Liturgy of the Hours. These liturgical functions take place in a more solemn and dignified manner than is usually experienced in parish churches and in smaller religious houses. The liturgy is on-going and should take place in the most ideal form possible. The Rule says that "nothing should be put before the work of God," that is the Liturgy of the Hours or Divine Office. No other duties or responsibilities should regularly interrupt this dedication to public worship and prayer. Monks carry out this duty in the name of the Church and for the Church and for all those in need. The 'Work of God' will continue into the next world where praise and thanksgiving to God will never end. Hospitality. According to the Rule, guests are to be received "as Christ" at the monastery. Usually Benedictine houses provide accommodations for guests who visit for a few days. Although the Rule recognizes that a monastery may find it necessary to turn away certain disruptive guests, such occasions are considered rare. For the most part, visitors should be made welcome at the monastery and should be allowed to benefit in some way from the prayer and liturgical life of the monks.